Fergus O’Ryan RHA ANCA (1911-1989) is better known today as a painter but he spent most of his working life as ‘a professional designer and commercial artist’ as a 1949 catalogue described him. He worked with McEvoy’s Advertising Services in Dublin in the early 1940s and in 1943 he was with the Rank Organisation working at the Theatre Royal. He became art director and remained there until it closed down in 1962, designing backdrops and scenery as well as cinema posters. From there he went on to teach lithography at the National College of Art until his retirement in 1976. His paintings, though well executed, are quite anodyne and hark back to Impressionism. What little I’ve seen of his commercial and print work is much more interesting. I would quite happily have a print of the In Monavalla cover on my wall. The character on the cover looks like the Man in the Gray Flannel Suit although I’m not sure if that was the intention. 63 pieces of O’Ryan’s commercial work sold as part of a lot of ’60s and ’70s Irish Sweepstakes advertising art in 2005. Genre fiction has never really taken hold with Irish publishers. The zealous censorship of publications during the first few decades of the State probably played a role but it is more likely that there just isn’t a big enough population to sustain indigenous mass market paperbacks. The above examples of crime, mystery and horror covers display a charming amateurishness. 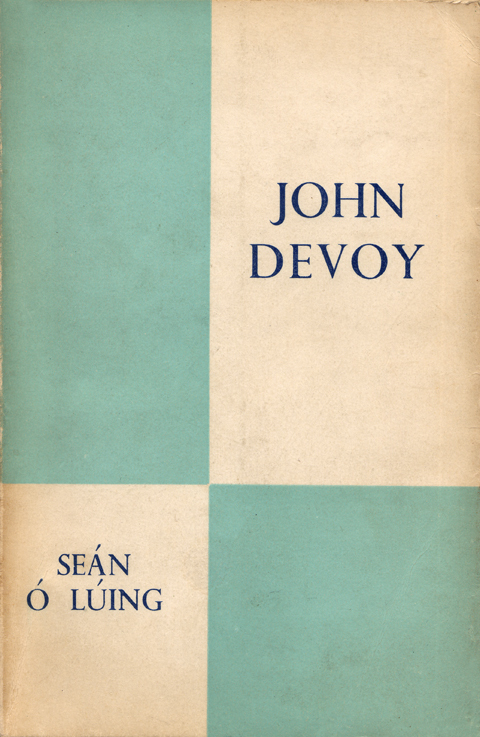 The first three are from The Mercier Press’ Irish Pocket Books imprint which operated in the mid-fifties. Michael Gallivan illustrated the first two and the third is by a mysterious ‘Osborne’. I’m afraid I can find no information on either artist. Larry Hynes kindly provided two of the examples which he included in a beautiful poster design celebrating 21 years of Charlie Byrne’s book shop in Galway. There are 24 years between the next two examples, 1947’s Valentine Vaughan Omnibus and A Case Book of Ghosts from 1971, although the latter cover could easily be from the same period. Unfortunately, I don’t own a copy of the Valentine Vaughan book. The October 2010 issue of Book and Magazine Collector, from which the image is taken, estimates it’s value at £150-£200 sterling! The book is set in London but was published in Dublin by Grafton. The final two covers are from Sáirséal agus Dill’s Scéalta Mistéir (Mystery Stories) series from the sixties. Úna Ní MhaoilEoin presents a rather naive rendering of a smoking pistol on the fifth book in the run, Triúr don Chómgargadh. I previously posted another of her designs for the series, An Masc. 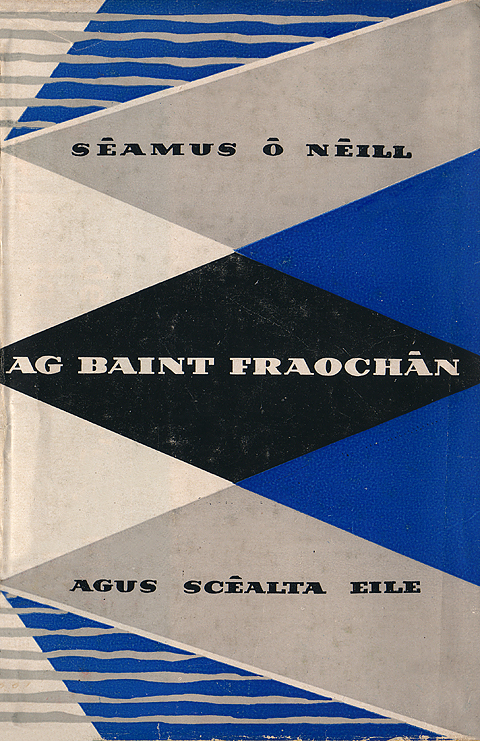 Ní MhaoilEoin wrote and illustrated a number of travel books for Sáirséal agus Dill during the sixties including An Maith Leat Spaigiti? (Do You Like Spaghetti?) (1965) and Turas Go Tuinis (Trip to Tunisia) (1969). According to Manchán Magan the Sunday Dispatch described her books as the most amusingly outspoken books ever to have appeared in the Gaelic language. 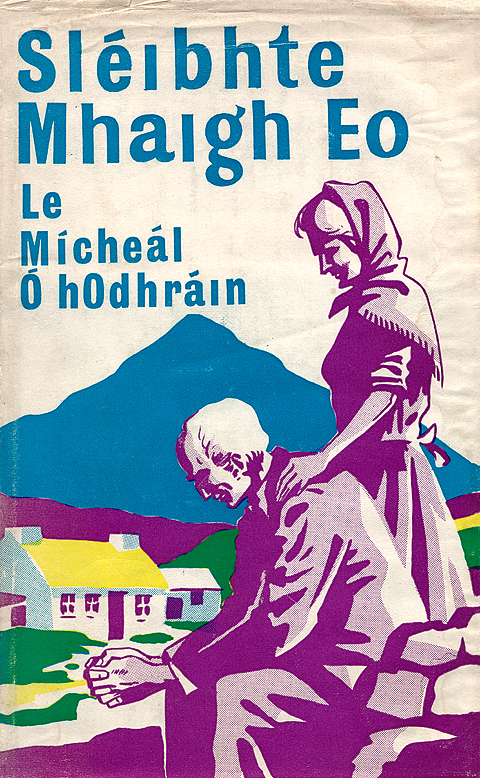 I believe that Cló Morainn started publishing in 1955. 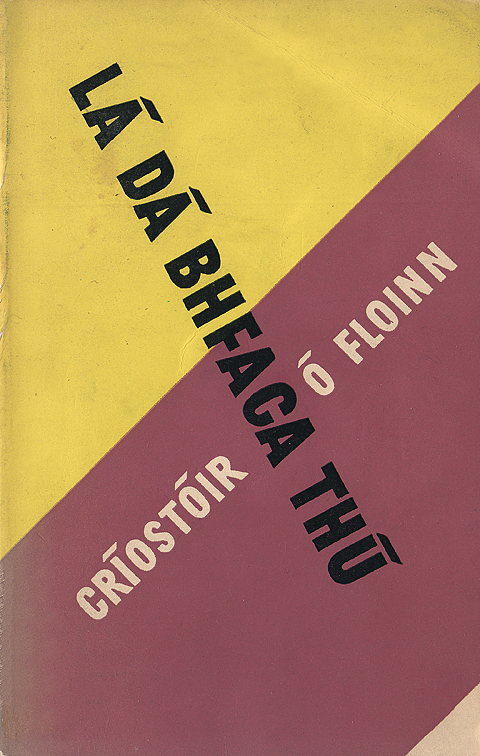 It is mentioned as a new venture in a review of Críostóir Ó Floinn’s Glaotar na Ridiri in The Irish Times of April 26, 1955. 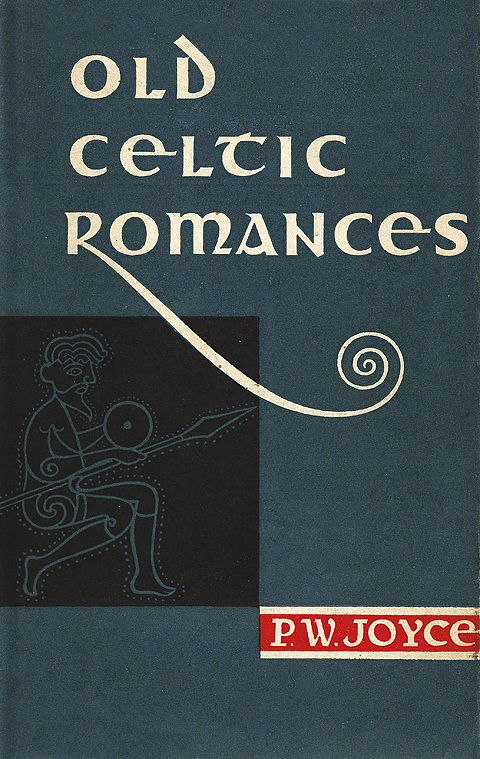 Sharing the page with the book reviews is Cruiskeen Lawn by Myles na Gopaleen (Brian Ó Nualláin) which seems appropriate as two of the Cló Morainn covers above were designed by Ó Nualláin’s brother – Mícheál Ó Nualláin. 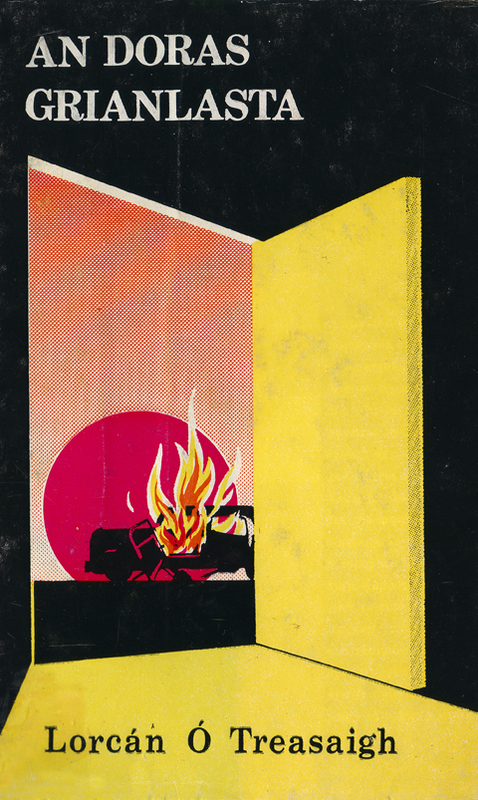 These covers have a very modern feel and eschew illustration, relying instead on typography and bold blocks of colour. Lá Dá Bhfaca Thú is particularly effective. Mícheál Ó Nualláin is an accomplished painter yet I hadn’t realise that he had also designed book covers until I stumbled on these examples. Since I last posted on the work of Karl Uhlemann I’ve managed to dig up some more nice examples of his work but more importantly I’m now able to fill in some biographical detail. Theo Snoddy’s very informative Dictionary of Irish Artists: 20th Century tells us that Karl Uhlemann Jnr was born in 1912. His father Karl Snr was a landscape painter born near Leipzig. I still can’t say for definite if he was born in Ireland but we do know that his father was resident in Dublin from 1915 when he first exhibited at the R.H.A. Karl Snr obviously had an influence on his son’s choice of career and the creative streak in the family continued with Karl Jnr’s son Rai. I will feature some of Rai’s work in a future post. These examples of Karl Uhlemann’s work are from dates between the late forties and the early eighties – almost 35 years. 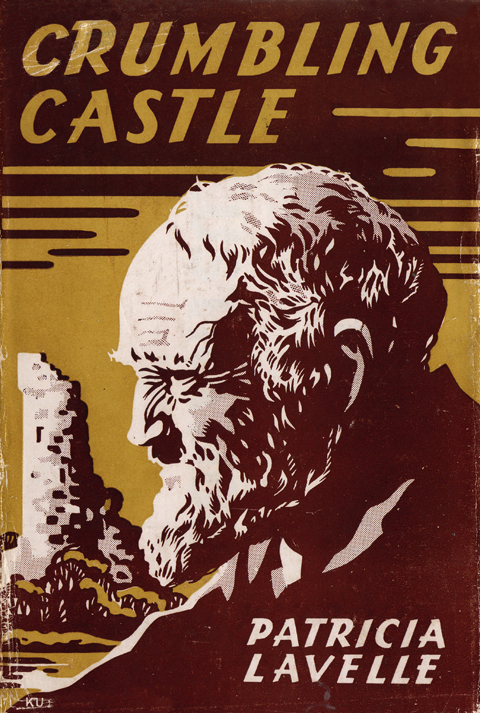 Crumbling Castle is the earliest example and although it is uncredited, the KU in the lower left hand side and the similarity to other covers by him leave us in no doubt. 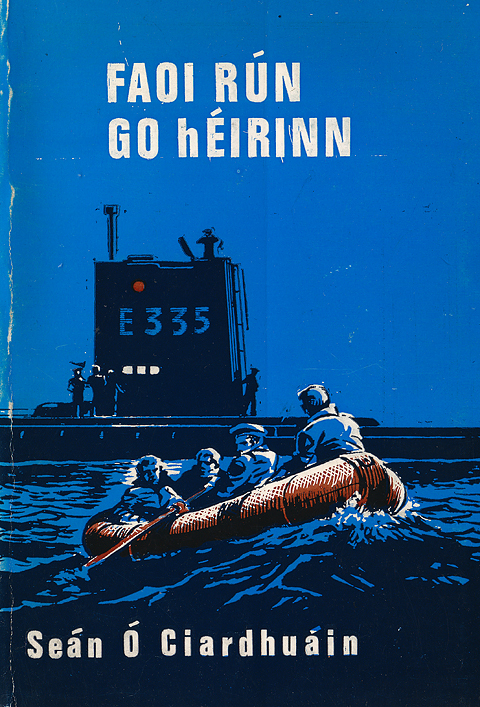 My favourite of these covers is Faoi Rún Go hÉirinn. The moonlit illustration, which raps around to the back cover, is beautifully rendered and doesn’t suffer a bit from the rough print job. An Doras Grianlasta is the least successful. The typography feels like an after thought and there has been no attempt to tie it in with the illustration. It is a good example of how design quality suffered as a result of technological ‘advances’ in the late seventies and into the eighties. 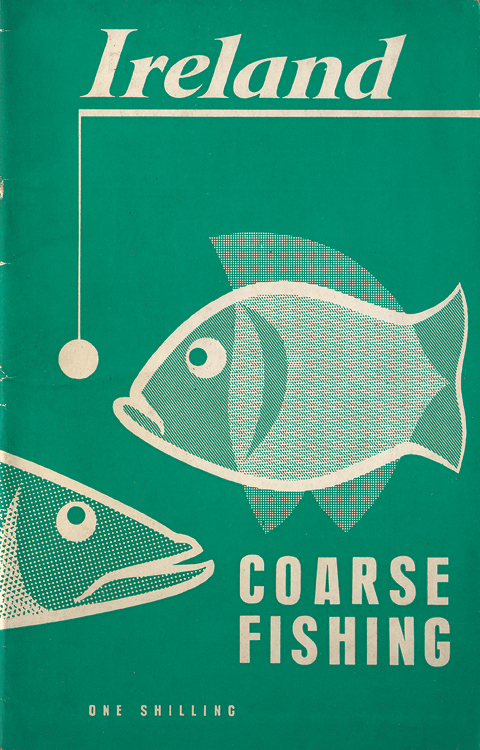 These three fishing guides from the early sixties are aimed at international visitors rather than the home market. The illustrations of the fish have been handled quite differently on each yet they still have the feel of a set, helped by the single colour limitation and the repetition of ‘Ireland’ in Perpetua bold italics.